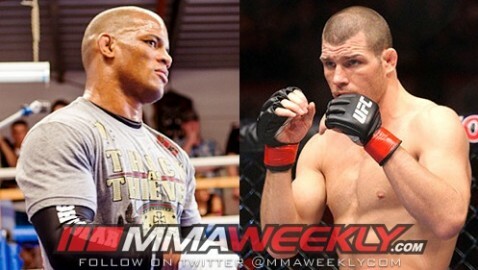 After UFC on FX 6, Hector Lombard made his claim that he wants to put an end to his feud with Michael Bisping by settling the score in the Octagon. Since before Lombard’s debut in the UFC, middleweight contender Michael Bisping has been working to get under the former Judo gold medalist’s skin, and it’s worked like a charm. Lombard has been chomping at the bit since July to get his hands on Bisping. After scoring a lopsided victory over Rousimar Palhares at UFC on FX 6 in Australia, the American Top Team standout told the media how he’s anxious to get in there with the Brit. Even going as far as saying how he’d be ready next month should Belfort happen to get injured. Although Lombard’s ready to jump in on a moments notice, Bisping is fighting Vitor Belfort next month, and it looks like Lombard will have to wait it out. At the end of the day though, the rivalry between Lombard and Bisping looks like it’s only going to continue to be a heated one from here on out. Stay tuned to MMAWeekly.com for all the latest UFC on FX 6 news and fight coverage.